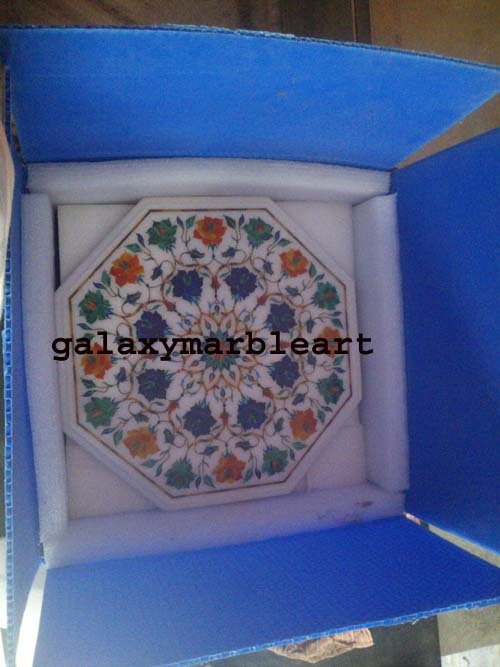 We ship marble inlay items worldwide by DHL,UPS, FEDEX, TNT and these are home delivered. Items shipped by air are--Boxes,plates,trays,tiles,coaster sets,elephants,small vases,glasses,photoframes,bowls and Table tops which are up to 36"diameter are sent in pvc box packing in air bubble and E.P foam sheet and are insured and home delivered in 8-10 days from the date of shipment. The charge is according to the weight of the packet. The shipment can be traced on the agents website for which we provide tracking no of the shipment. Smaller items mentioned above are cheaper to ship by courier, if there is a big quantity of these small items than we have the option by sea also but for that we have to do calculations and compare the costs of two--courier and sea cargo. Bigger items like big table tops which are 48" and more in diameter, and bases for these big tables are cheaper to ship by sea, and are much cheaper than air shipments. Other advantage with sea shipment is that the second item cost less to ship and the third even less. Takes about 40-50 days and are delivered at the nearest custom warehouse. Shipment are charged by volume i.e. CBM (cubic meter). Minimum charge is for 1 CBM and if volume exceeds 1CBM, then charges are for the actual volume of the consignment.Though these big table tops and heavier shipment are cheaper to ship by sea but can also be shipped by air for which special rates are provided to us by the shipping agent. Home delivery for shipments by sea is also possible for which the buyer will have their items delivered at their door steps.In this case the buyer doesn't have to go to the Sea port for custom clearance etc. All the necessary custom paper work is done by our agent and good are transported to the buyer's address. This costs more but no effort is required on the part of the buyer for delivery. We get the shipment insured from our warehouse to the buyer's warehouse under MARINE INSURANCE POLICY and if unfortunately anything goes wrong with the shipment our buyers gets the refund from the Insurance Company at home..Our insurance company is in partnership with the insurance agents all over the world. After the shipment we provide the Insurance Certificate in which all details are given i.e.items details,buyer's address, the address of Survey Agent and Claim settling agent. Comparison of the cost of shipment by air and sea can be made on our website by choosing the shipping option where both cost comes up for the selected item(s). Below is an examples of 48' table top packing----packing is done PU foam and EP sheet and placed in wooden box 1" thick for shipping by sea. Small table tops and small items such as plates,boxes,tiles,coaster-sets,elephants are packed in EP and PU foam and placed in PVC box. Also done in EP and PU foam and placed in PVC box.